Eurasia's largest volcano Klyuchevskaya Sopka, in Russia's Far East erupted on Sunday, shooting hot ash miles into the air, the local geophysical service said. 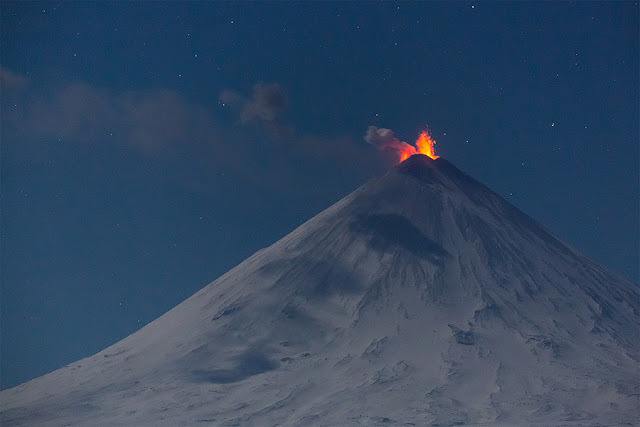 "The eruption was detected by seismic sensors, and satellite images show that the eruption column rose 6 kilometers [3.7 miles] above sea level," a representative of the Russian agency told RIA Novosti. The volcanic ash cloud has spread over an area of almost 13,500 square feet. It has drifted 124 miles southeast toward the Sea of Okhotsk, in the Pacific Ocean. There was no immediate threat to the public safety. Ash was blown away from nearby towns, emergencies services in the Kamchatka region said. The 15,580-feet volcano in Russia's Kamchatka peninsula has been rumbling to life since the beginning of April. It has been almost continuously active for the past 50 years but the number of tremors and ash eruptions has been on the rise lately.